The problem of self-organization of self in the context of uncertainty arises in connection with the development of projects and programs of transformational education for adults, the need of which is due to the deep processes of global transformations in the modern world. Transformative strategies and programs for the development of the content of higher education, outlined in the list of key educational competencies for the 21st century by international organizations (EU, UNESCO) are associated with the processes of becoming and transformation of individuals as integral subjects of cognition and action within the framework of communicative strategies for the formation of a global civil society. The development and implementation of transformative higher education strategies in a content aspect requires transdisciplinary research methodologies for adult learning aimed at developing a “holistic person” and his self as a source of creative development. The first part of the article is devoted to the analysis of the evolution of views on self in the metaphysical tradition, which was mainly concentrated around the binary-opposition systems of argumentation, presented, on the one hand, by the Cartesian philosophy of self as substances, on the other - the Hume's vision of self as a bundle of perceptions. The dynamics of the argumentation of these metaphysical contrapositions, which immanently contain both the centrifugal intentions of discourse, and are mutually attractive, is considered. The substantive theses of these philosophies, which marked the development and branching of the general tendencies in the study of self and which can serve as a methodological complementary ground in our efforts to overcome binarism in the study of self in the context of post-metaphysical queries, are analyzed. The relevance of transversal self in the context of uncertainty as a process-dialogic unity of differences in the liminal space at the global and individual levels is determined. Aristotle (1978). Categories. In: Works in four volumes. Vol.2. M.: Mysl', 51-90 [in Russian]. Gorbunova, L. (2013). Theory of Transformative Learning: Adult Education in the Context of “Liquid Modernity”. Filosofiya osvity. Philosophy of Education, 2 (13), 66-114 [in Ukrainian]. URL: www.philosopheducation.com. Gorbunova, L. (2016). Key Competencies in Transnational Educational Space: the Definition and Implementation. Filosofiya osvity. 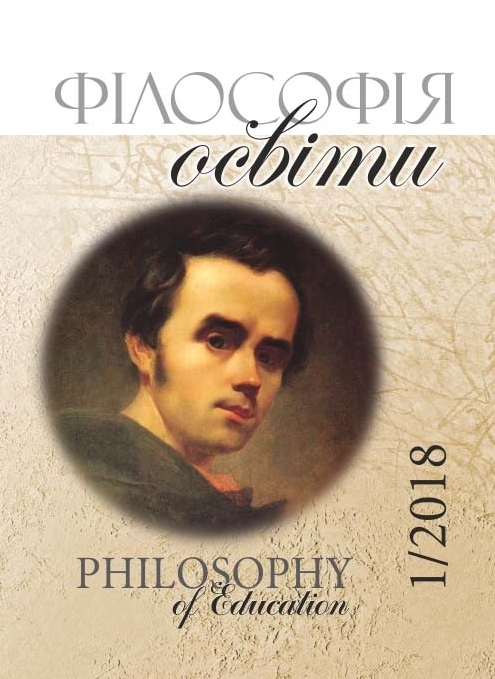 Philosophy of Education, 2 (29), 97-117 [in Ukrainian]. URL: www.philosopheducation.com. Gorbunova, L. (2017). Self in a Space of Liminality: Toward the Rationale for Transformative Strategies of Higher Education. Filosofiya osvity. Philosophy of Education, 2 (21), 71-97 [in Ukrainian]. URL: www.philosopheducation.com. Hegel (1959). Phenomenology of the spirit. In: Works, Vol. IV. M.: Mysl' [in Russian]. Hume, D. (1740/1965). A Treatise of Human Nature. In: David Hume. Works in 2 volumes, T.1. M., 1965 [in Russian]. Leibniz, G.-V. (1982). Monadology. In: Works in four volumes: T.1. M.: Mysl', 413-429 [in Russian]. Schelling (1987). The system of transcendental idealism. In: Works in 2 volumes, V.1. M.: Mysl', 227-489 [in Russian].